that he lay down his life for his friends. George Winton Thompson was born September 16, 1940 in Beckley, West Virginia the youngest of four sons to Gilbert and Dorcas Thompson. George’s progression through life included: Institute Elementary School (called grade school at the time) through grade six, Beckley Junior High School through grade nine, and Woodrow Wilson High School (WWHS) where he graduated on May 27, 1958. 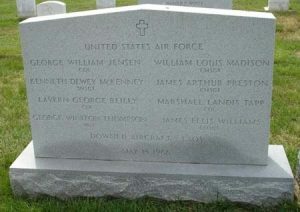 George attended two years of classes at West Virginia University, received a commission in the United States Air Force in June of 1963 and was sent to Vietnam in November 1965 where he died on May 15, 1966, resulting from a crash of the AC-47D aircraft he was navigating. His remains lay at the site of the disaster for more than 29 years before being recovered and another four years passed before his remains were positively identified.In life, George was not the shortest in stature among the boys who belonged to the WWHS class of 1958. John Estep and Mainard Hicks were shorter and perhaps Bobby Mullins, but not by much. My first recollection of George Thompson is of a very short, dark hair kid with a big nose, dribbling a basketball that seemed half as large as he was. George was playing basketball for Institute Elementary School, I was playing basketball for Lincoln Elementary School and the year was 1951 or 1952. We both played guard positions. What George lacked in size he made up for in tenacity. He could steal my dribble but because he was so short, I could not steal his dribble without fouling him. I have often wondered how Charles Schultz, the creator of the Peanuts cartoon characters would have drawn George and the rest of us at that age as we ran up and down the court in the old Beckley Recreation Building. Another year passed and both of us were attending Beckley Junior High School in seventh grade. I remember George carrying a basketball with him every where he went. He would organize pick up games at school and after. George’s best friend within our class at the time was Barney Pippin, the largest boy in the class. They made quite a pair walking back and forth to school, particularly noticeable because of the difference in their sizes. Barney was an excellent athlete in all sports. He moved to Miami, Florida after our sophomore year. As for organized basketball, George played on his homeroom team but not on the team that represented the school. Neither did I. We confined our efforts to the intramural activities offered through our respective homerooms. The school level team that George did play on during seventh and eighth grades was the football team. He went out for the team and was given a uniform. However, as we began ninth grade, more players and particularly larger players came into the school from surrounding feeder schools that had included eight grades. The coaches, fearing injury offered George a position as equipment manager and he accepted. According to legend, the legacy of George’s two years as a football player earned him the nickname of “Little Rock”, which would follow him all of his days in Beckley. George also played organized baseball during his Little League and Intermediate League years. There is a picture of George in one of the Beckley books posing with the rest of the 1954 Calfee Funeral Home Team (Babe Ruth League). On to high school and in mid August the “two-a-days” began for the football team. George took up his position as equipment manager, which placed him on the team and provided his travel with the team for away games. To be sure, the players who benefited from his services appreciated George being there. Within that short frame the heart of an athlete continued to beat. At Woodrow Wilson, George found new opportunities in wrestling and track. In his junior year, George placed second in the 115 pounds weight class at the West Virginia High School Wrestling Tournament on February 22, 1957. George’s achievement contributed to the Beckley wrestling team placing third overall in the state championship. During his senior year, George was one of the co-captains of the wrestling team along with Harold Meade. On February 6, 1958, George and Harold along with Bob Wills and John Pyles won their individual wrestling matches contributing to a 25-13 victory over the Hinton Bobcats in Hinton. That event ended the regular season schedule for the Beckley grapplers. On February 22, 1958, Woodrow Wilson placed third at the 11th Annual State Wrestling Championship. George Thompson took third place in the 115 pounds weight class, John Spinelli placed third in the 123 pounds weight class, Bob Wills placed third in the 130 pounds weight class and Harold Meade placed second in the 141 pounds weight class. George was a letterman in track and field during both his junior and senior years. He is best remembered for the pole vault. He placed first in this event at the Coalfield Conference Invitational during his senior year. And George found a way to include his first love, basketball into his athletic program. Our high school team was exceptionally hard to earn a position on, partly because of the large student body and also because of the success of the program. The alternative available to those of us not earning a roster spot on the school team was the local Church League playing its games at the old Beckley Recreational Building. Ten churches sponsored teams in this league. Eligibility for participation was gained by attendance at the church on whose team you played. During his senior year in high school, George played on the First Christian Church team (Prince and Fayette Streets) with Sam McClure, Jim Lowe, Hobie Shumate and Gene Bryner. Outside of athletics, George might be best described as a balanced student. His grades were good and he participated in several extracurricular activities spending one year in different clubs rather than all three years in one or two. His interests included the Athletic Club, Visual Education Club, Key Club, Booster Club and Hi-Y. George had a part as one of the end men in the annual Minstrel show during his senior year and attended Boys State (a student government program) as a delegate during the summer of 1957. He is described as “A man of thought and action” in the 1958 ECHO (yearbook), a very good description. At the end of his second year at WVU, George felt the need to step back and take another look at his academic interest to determine if the field he was pursuing was going to take him where he wanted to go in life. But this move came at a perilous time due to the military buildup resulting from the armed conflict in Vietnam. Realizing that he was no longer enrolled in college, that he was single and that the draft might soon catch up with him, George turned his attention to the United States Air Force. Bill Turner (also in the Air Force at the time) informs us that George attended a four-day evaluation at Lockborn Air Force Base in Columbus, Ohio. At Lockborn, George took qualifying examinations for officer cadet school and flight training. The tests he took determined that George had the intellectual and physical skills to enter the flying program before he actually entered the military. With flight training looming on his radar screen, George enlisted on October 22, 1961. He went through basic training at Lackland Air Force Base in San Antonio, Texas. Classmate Corky Lively who went through Lackland in 1958 remembers the base as being “huge, old, flat, hot and lots of recruits”. John Spinelli remembers his recruit experience at Lackland as a sequence of dehumanizing experiences during which he learned to keep quiet because no one in charge wanted to hear his opinions anyway, to speak only when spoken to and then with as few words as possible. The rigors of basic training were then completed with desirable results that benefited John during future assignments. From Lackland, George was sent to James Connally Air Force Base in Waco, Texas awaiting orders to flight school to learn the skills necessary to become a navigator. Pilot training was limited at the time to four-year college graduates. George entered the combined officer cadet and flight training program about June of 1962. Life in a training command is not a pleasure cruise, at least for enlisted personnel. Someone who always seems to have a mission in life to keep you from getting where you want to go is constantly on your case about the pettiest of matters. There are a lot of fatigue details, spit and polish routines, more than the normal allotment of inspections in addition to your studies. Even “time off” in the barracks does not exempt one from seemingly unnecessary and at times, unreasonable scrutiny. Barracks rats become susceptible prey for clip board NCOs needing a body to stand sentry duty bailed out on by someone who checked into sick bay, a detail to whitewash rocks or other mundane tasks. During his stay in flight training George was able to escape his off-hours training command environment through visits to Bill Turner’s apartment off post. While other trainees were coping with the clipboard NCOs on post, George was replacing his drudgery with niceties of life, including home cooked meals from Mrs. Turner’s table. He graduated from his program and was commissioned a second lieutenant one year after entering it and went into the wild blue yonder as a qualified navigator – a Little Rock in the sky, so to speak. While in Vietnam, George served with the 4th Commando Squadron flying out of Tan Son Nhut Airbase. He flew in a Douglas AC47D transport aircraft that was converted to a gun platform by adding a row of 7.62-mm mini-guns along the left side of its fuselage. This aircraft was nicknamed Puff the Magic Dragon by observers and Spooky by the airmen who flew in them owing to the nocturnal nature of their missions. The classic maneuver of the AC47D was to fly overhead of American or South Vietnamese troops in a pylon turn spraying torrents of gunfire down on enemy troops approaching those troops being protected. On May 15, 1966, the aircraft George was navigating was deployed as an armed visual reconnaissance mission to search out and engage targets they might find along two roads that were a part of the Ho Chi Minh Trail. A crew of eight Americans (including George) and two Vietnamese observers were on board. The mission was scheduled for six hours flight time. The destination was Saravane Province in Laos where the North Vietnamese had established their largest supply depot outside North Vietnam. This area, designated Oscar Eight on flight maps claimed more American lives than any other location in Laos. Having been assigned the call name of Spooky Ten, the pilot radioed status and position of the aircraft at 1745 hours, or 5:45 p.m. by the watch on most of our wrists. He radioed again at 2100 hours (9:00 p.m.) that the situation was normal, but did not give a position. This is somewhat significant in relation to the eventual search effort because the mission had included a secondary reconnaissance if time permitted. When Spooky 10 failed to return to base, it was listed as missing the following day. This action added the names of the ten persons on board as Missing In Action. Eight in the United States and two in South Vietnam. On May 17, the Beckley Post Herald carried the announcement of George’s missing status on Page One. George’s mother, Dorcas Thompson issued a brief statement. At that point, she didn’t know much. The article noted that George’s father had died in 1956 but all three of his brothers were alive at the time. On June 7, a Pathet Lao radio broadcast gave credit to a North Vietnamese anti- aircraft gun crew for shooting down an American C47 that corresponded to the mission of Spooky 10 and reported that all ten crew members had perished in the crash. However, one of the aircraft’s crew was later reported as having been in the company of returned Prisoners Of War. Identification and credible information was further complicated due to leaving Laos out of the Paris Peace agreements, thus veiling knowledge of the “secret war” the United States had engaged in there. The result is that not one single American Prisoner Of War has ever been released by Laos. The suspense was not to be lifted for years to come. While she did not know whether to mourn George’s loss or anticipate his return Mrs. Thompson coped as best she could. The Air Force gave her updates during which they asked that she continue to send letters and packages in as much as George’s name was neither included on lists of prisoners nor confirmed dead. Warm socks, was one of the items the Air Force recommended be placed in the packages. The packages were shipped with regularity, but not acknowledged on the other end. Where his classmates were concerned, one by one we began to let go and accept an unknown fate. George’s Mom designated a burial site at Blue Ridge Cemetery, next to his older brother Bob in the event George’s remains were returned to Beckley and she was no longer available to give direction. In the early 1970s, Mrs. Thompson’s packages started being returned. In January 1973, George’s name failed to appear on an official list of Prisoners of War but Mrs. Thompson wrote the Register-Post Herald in February that she had not given up hope. In 1978, George’s status was changed to Killed In Action, a longevity decision. During these years George who had held the rank of 1st lieutenant when he went missing rose to captain and then to major. It was not until 1994 that solid evidence about George’s fate developed. In August of that year a representative of the Vietnamese Office For Seeking Missing Persons (VNOSMP) had a chance encounter with a retired member of the North Vietnamese Army who told of a crash site in Khammouan Province, Laos he had personally visited. The retired soldier told the VNOSMP official to expect to find three multiple burial pits. After confirming that Vietnamese records included this incident, a team from the Joint Task Force for Full Accounting (JTFFA) traveled to the crash site where they collected several aircrew-related items. While we will never fully understand the circumstances that caused the crash that stopped the heart of an athlete, the consensus of Vietnam Conflict veterans who have heard this story is that the aircraft was shot down by enemy ground forces. The fact that there was no radio transmission indicates there was no time available to make one. The C47 aircraft made a good gun platform for a specific purpose. But its Achilles heel was that it was slow and it was noisy. Always a ready target even as it sought it’s own targets of opportunity. It seems so long ago now, our school years, our classmates, our military service and our anxiety about George’s fate. Yet, at other times, it seems like yesterday we put away our school texts, donned military uniforms and a special classmate was called upon to make a special sacrifice. As I remember the boy who became that man, I am certain had he known it would become his last mission before he flew off, he would have boarded the aircraft anyway. That was “Little Rock’s” nature. First and foremost, I want to acknowledge Bill Turner’s contribution to this story. Bill is a WWHS-1956 alumnus. Besides watching George grow up from a slightly senior perspective (two years) Bill roomed with George at West Virginia University and served with George in the United States Air Force, including Vietnam service. Bill and I had a long discussion about George at the Golden Eagles Reunion in June 2005 and Bill responded to a rather long e-mail interview. Classmates Al “Corky” Lively and John Spinnelli contributed original research in the form of thoughts about their Air Force experience. John also provided memories of George as a classmate and wrestling teammate. I consulted and used information included in two articles found on the World Wide Web by Googling George’s name. The first article is: THOMPSON, GEORGE WINTON Remains Recovered 11 March 1997; Identified 24 November 1999 – compiled by Task Force Omega, Inc. No author is acknowledged. The second article is: THOMPSON, GEORGE WINTON Remains Returned 12/13/99 published by PowerNetWork.org. No author is acknowledged. Both articles reference official reports and news releases. 1. Defense Dept. says 1st Lt. George Thompson missing in flight over Southeast Asia – appeared in the Beckley Post -Herald, page 1, column 1, May 17, 1966. 2. George Thompson’s name omitted from official list of POWs and MIAs in Vietnam – page 2, columns 1-4, January 28, 1973. 3. Mrs. Dorcas Thompson still not giving up hope for return of missing son in Vietnam – Beckley Post Herald-Raleigh Register, page 9, columns 1-4, February 24, 1973. Raleigh Vietnam Airman laid to rest after 34 years – The Register-Herald, page 7A, columns 1-5, May 18, 2000. Specificity pertaining to events from George’s high school years is partially taken from Phyllis’ Scrapbook – a collection of articles, pictures and memorbellia provided by classmate Phyllis Fitzwater-Marshall and published on the WWHS Class of 1958 website (wwhs1958.org). George Winton Thompson, along with his crewmates died on May 15, 1966 in Khammouan Province, Laos while engaged in a combat mission during the Vietnam Conflict of the 1960s and early 1970s. This picture was downloaded from Here.